During the Christmas holidays, we took a two week KiwiExperience bus trip around the South Island. Over 15 days we slept in 9 towns and visited many more. I have divided the trip into 3 sections. This is the third: Dunedin, Catlins, & Milford Sound. The final section of the trip was a 3-day clockwise loop around the Deep South, starting & finishing in Queenstown. We departed mid-morning and drove almost straight through to Dunedin. Not much was open by then, but we joined the last tour of the day at Speight’s Brewery. The tour ended in a bar where we sampled 6 tap beers and enjoyed endless refills for 30 minutes. In the morning we drove south and west through the Catlins along the Southern Scenic Route. We had several chances to get off the bus for a walk, including multiple animal encounters. This was a highlight for me! We saw fur seals, sea lions, and the rare yellow-eyed penguin. After waiting on shore for ages I had given up on the penguins, but one finally popped up out of the water and gave us a show! Again we arrived at our destination in the evening so not much was open in Invercargill, but we ate a delicious dinner at Bombay Palace based on a friend’s recommendation. The final day was the longest day on the bus, but one I had looked forward to the most. We were finally going to cruise Milford Sound! Following a quick rest stop in Te Anau we continued on to Fiordland National Park. It would have been nice to linger in this idyllic setting, but since we had a boat to catch we made only 3 brief stops along the way, including filling our water bottle straight from a stream. 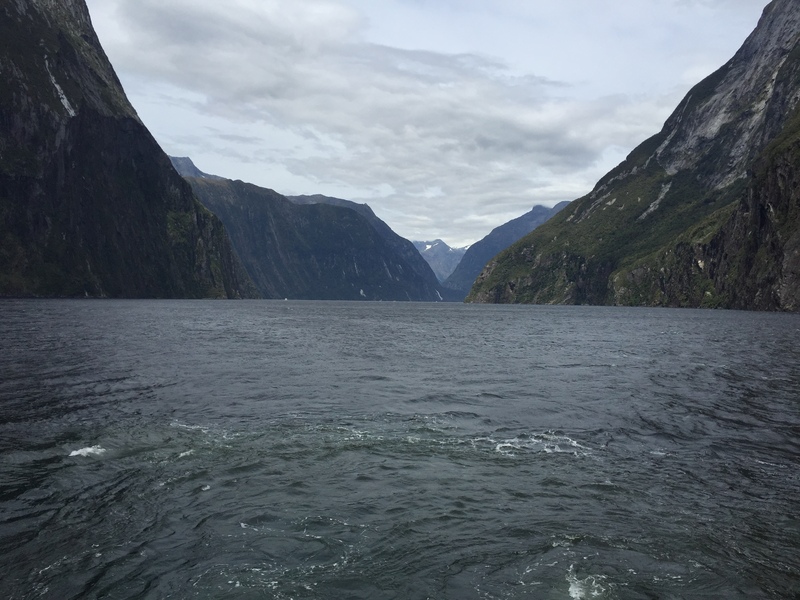 We filed onto the Juicy boat and began our 2-hour cruise through the majestic fjord; the captain shared information as we passed seals and waterfalls. It is impossible to describe the beauty and size of Milford Sound, but it seemed to put the world in perspective. I felt small, insignificant. Back on the bus we had a long drive back to Queenstown. Mind-numbing drive from Queenstown. We stopped for tea breaks in a couple towns, but I was surprised there were not more sights or scenic places to stretch our legs. Walked up Baldwin Street again. Wanted to tour Cadbury World, but it was closed when we arrived in the late afternoon and we had an early departure the following morning. Speight’s Brewery Tour was worthwhile with an opportunity to pour your own tap beers. Weather was rainy and overcast. Stayed at On Top Backpackers; quiet after 10:30pm; simple toast and cornflake breakfast. Hiked and saw fur seals at Nugget Point. Tens of sea lions at Cannibal Bay, swimming and on land. Quick stop at Purakauni Falls. 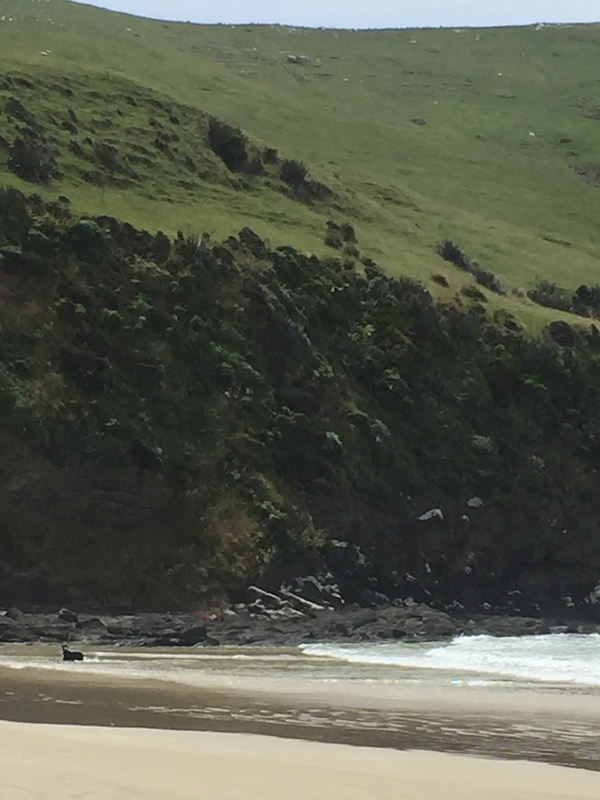 The rare yellow eyed penguin at Curio Bay! Perfect dinner at Bombay Palace in Invercargill. Tuatara Backpackers in Invercargill was a loud hostel; could hear doors slamming throughout the night. On the bus most of the day, but hopped off for a few photos and of course the 2-hour Milford Sound cruise. Good, dry weather so we did not see the millions of spontaneous waterfalls that come to life in the rain, but the permanent waterfalls were impressive. Ended the tour in Queenstown and stayed at YHA Lakeside.